1. Mix the dry ingredients together in a bowl. 2. Mix a few drops of green food coloring into the spray bottle full of water. 3. Lightly spritz (one or three sprays) the dry ingredients in the bowl of water and mix thoroughly. Repeat as needed until the mixture is damp enough to stick together when you test it by rolling it into a small ball with your fingers. Tip: Do not dump or pour water into the bowl of dry ingredients or you may fizz your bath bombs before you can use them in the bath! 4. If you want to scent your bath bombs with essential oil, add a few drops to the mixture. I left mine unscented because I’m not sure what zombie skulls are supposed to smell like other than probably not flowers which are the essential oils I have on hand. I’ll trust your judgment on this one. 5. 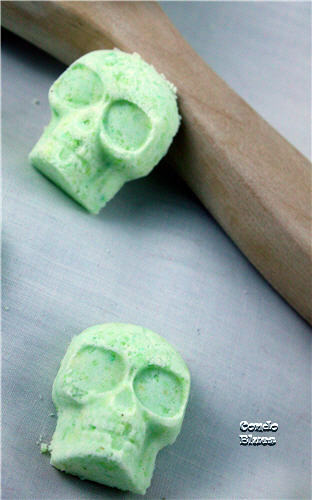 Firmly pack the bath bomb mixture with your hands into the skull ice cube tray. 6. 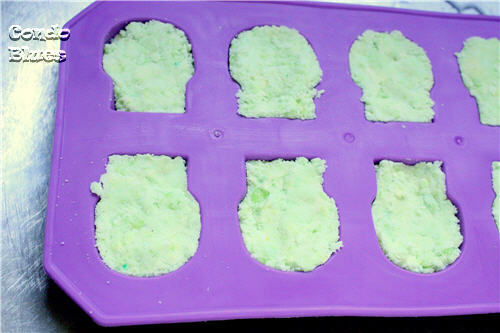 Allow the bath bombs to dry for at least two hours. 7. Carefully remove the zombie skulls from the ice cube tray. 8. 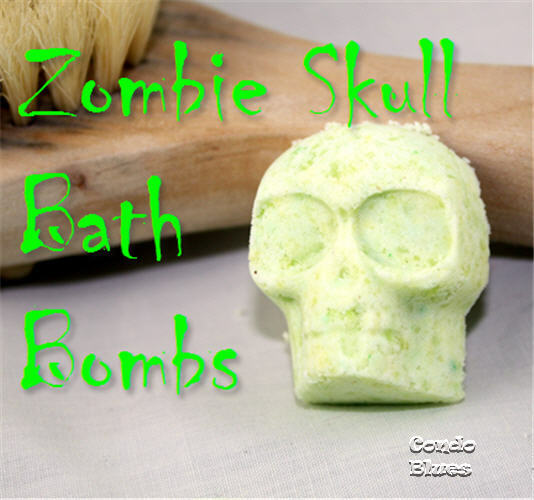 Plunk them in the bath and wash your dirty zombie kids! If you are looking for a non candy Trick or Treat option, wrap up a bunch with a label (you don't want to trick them into eating them. It won't hurt them but it probably won't taste very good either), and give them to Trick or Treaters on Halloween.